BANGI, 3 November 2014 – The rising trend of nutritional imbalance and malnourishment should be brought under control in this country. A nutritionist at The National University of Malaysia (UKM) Prof Dr Mohamed Ismail Mohd Noor said obesity and malnourishment can become worse because of lifestyle and misconceptions about nutrition. Prof Ismail, a former Deputy Dean of the Faculty of Allied Health Sciences (FSKB), said that the problem can be addressed through education and dissemination of information, particularly through schools and medical centres. 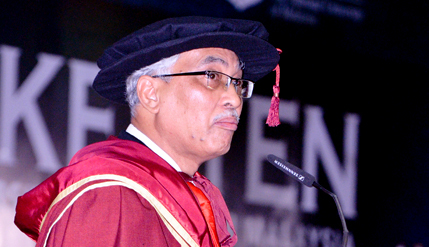 Speaking after being awarded Emeritus Professor at the 5th session of the 42nd Convocation of UKM here today, he said if obesity and nutritional imbalance are not brought under control, both will adversely affect the health of children and adolescents in the country. Prof Ismail said when he was Head of Department of Nutrition and Dietetic (1998-2005) at FSKB, his research on nutrition found a huge gap between developing and developed countries. In developing countries there is malnourishment caused by lack of protein noting that imbalance consumption of food resulted in health issues and even death among children. In Malaysia the problem is more about nutritional imbalance due to misunderstanding about the nutritional value and too much protein and fats from fast foods. Prof Ismail is a Fellow of the Malaysian Scientific Association whose advice is often sought in the formulation of policies on sports nutrition. FSKB Dean Prof Dr Siti Zamratol-Mai Sarah Mukari, said Prof Ismail is a respected scholar internationally in the field of nutrition particularly in energy needs. Introducing Prof Ismail, Prof Siti Zamratol-Mai said the results of his research have been published in more than 12 books. He is also a member of the board of editors of high-impact international journals such as British Journal of Nutrition and the Annals of Nutrition.